Laura Doyle’s marriage was in trouble. Desperate to avoid divorcing the man she loved, Laura tried something different: she started talking to women who’d been happily married for more than 15 years. What she discovered shocked her. Laura realized there are basic truths that can help women maintain loving, intimate marriages so she developed the Six Intimacy Skills™ helping over 150,000 women in 27 countries. She is a New York Time bestselling author of several relationship books, and her newest title is First, Kill All the Marriage Counselors: Modern Day Secrets to Being Desired, Cherished and Adored for Life. Kathy Murray is a Senior Relationship Coach and the COO of Laura Doyle Connect. Kathy has helped thousands of women revitalize their own relationships using the same proven skills that have helped over 150,000 women in 27 countries and 16 languages. Her friends, her daughters and even her daughter-in-law have all credited Kathy with helping them create connected marriages. Kathy is a powerful speaker who candidly shares the powerful impact of using The Six Intimacy Skills. 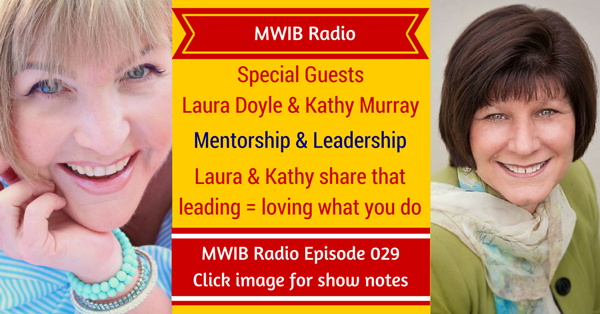 Click to tweet on Twitter: Laura Doyle & Kathy Murray share that being a leader is about loving what you do! Laura made a good point about a Zig Ziglar quote that you can get anything you want as long as you help other people get what they want. If your business doesn’t help other people make money, that doesn’t mean that your business doesn’t have value in the world. People want more than just money: they want good health, their children to grow up strong and healthy, etc. There are a lot of ways to create value in the world but you have to know what your client’s deepest desire is. For Laura and Kathy, they know that their clients want to feel cherished and adored by their husbands. Takeaway #2: What Do You Want? When looking for a mentor you have to ask yourself “What do I want?”. Does that mentor have what you want? Do they have a certain lifestyle you want to live or other similar priorities? Is that person living your dream? Kathy agrees that this is what made her drawn to Laura to be her mentor. What Laura had in her relationship is what Kathy wanted in hers. That’s how Kathy knew that she wanted Laura to mentor her in her own relationship. Kathy also advises to do your homework and don’t be afraid to reach out to that mentor you have chosen. Laura and Kathy are so passionate about their mission to end world divorce. Laura mentioned that sometimes it can be an overwhelming mission but that it’s so purposeful, gratifying, and rewarding. Kathy mentioned that she and Laura are giddy every day. It never gets old, they both agree. That’s how you have to feel in your business, especially as a mentor. You really have to LOVE what you do. When you’re not thrilled and excited when people have an amazing experience with your work or programs, they’ll feel it. Also, it’s hard to be a mentor to someone to teach them the benefits of your experience, if you don’t love what you do. Thank you so much for joining me this week. Please share your “Aha!” moments by leaving a note in the comments section below! And finally, don’t forget to catch the Military Women In Business Radio show live on Thursdays at 3:30pm Eastern. Click here to catch the show live! Special thanks to Laura and Kathy for joining me this week. Until next time! It’s wonderful to have show that serves and encourages military spouses. Our servicemen and woman do so much to care for and protect us, adjusting their entire professional careers so that we can be safe. What a wonderful service. Thanks for sharing this! You’re welcome Donna and thanks for stopping by! Kristen, all 3 of your takeaways remind me of just how important it is to take the time to think about what we are doing and plan it intentional as if it matters, because it does! It’s far too easy to get by on default mode doing what we’ve been doing before, or what comes naturally because it’s what’s expected, but this rarely gives us the impact we desire. Thank you Joseph! Glad you liked it and yes, I love that! It does matter, so go after it! I love the takeaway of “love what you do”! I know every day that I get to do what I love – and that it makes it all the sweeter knowing I’m helping people achieve their dreams along the way. You’re welcome Kim! I love your point about loving what you do helps other people. Great way to look at it.